Relaxation, privacy and effectiveness: these are the core elements through which Exentia cultivates and guarantees the effectiveness of your complete well-being. 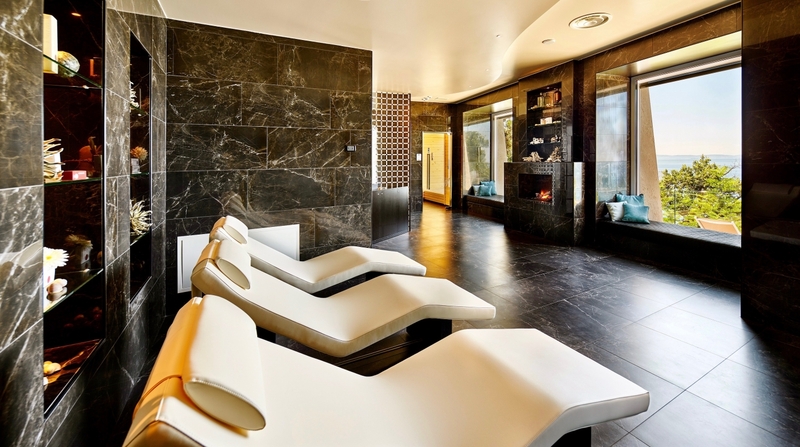 Exentia is characterised by its exclusiveness and treatments can be booked only by a limited number of guests. It is a temple with the unique traits of the Adriatic Sea, to be admired through the large windows of the spa, thus helping you relax and enriching the numerous services and treatments. Wonderful areas to enjoy in complete privacy, as they reflect the magic and the intimacy of the atmospheres of the Karst. The technologies, equipment and programmes are completely dedicated to your personal holistic care. The dermo-cosmetic products are all Italian products, a perfect touch for your skin through science and nature. The passion and the expertise of our wellness & beauty team, selected and trained to offer every guest a unique and specific well-being. A perfect and measured balance, in each area, where the fine coatings resembling the waves, the black marbles lined with white together with the light blue of the sea create a refined and private environment. Unwinding in our sauna with sea-view and in the soft light of the salt relaxation room is a must. All massages, treatments and beauty services are available 7 days a week. Opening hours are every day from 10 a.m to 1 p.m. and from 3 p.m. to 8 p.m., upon request also after 8 p.m.